It’s beginning to look a lot like Nutcracker Season! I couldn’t be more excited to say that we are a little over a week away from the opening of Curtain Call’s Production of the Nutcracker. 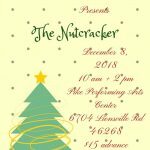 CC Dancers and teachers have been hard at work since August making this Christmas classic come alive and we hope to see you there on Saturday December 8. More information on tickets and our coveted Sugar Plum Fairy Pass below! And for all you ballet enthusiasts who are just so excited for opening day, here is a little information and fun facts to hold you over! The Nutcracker is based off the children’s fairy tale story “The Nutcracker and the Mouse King” by ETA Hoffman in 1816. Famous choreographer and composer duo Marius Petipa and Pyotr Tchaikovsky created The Nutcracker which debuted in St Petersburg Russia in 1819. It was considered a “flop” by most dance critics and was one of Petipa’s biggest failures in his career. The Nutcracker did not begin to gain popularity until the score was used in Disney’s Fantasia in 1940. Tchaikovsky did not love the adaptation of the Russian story, and worried that it would never be as good as The Sleeping Beauty the last ballet he had adapted from a story that was a huge success. Petipa designed the dances based upon the characters in ETA Hoffman’s story and asked Tchaikovsky to write the music with very specific instructions. Petipa designed the dances. He gave Tchaikovsky special directions about how the music was to be written. For example, he wanted a great crescendo of 48 bars as the Christmas Tree rose higher and higher in Act 1. He wrote that the music for the Dance of the Sugar Plum Fairy should sound like drops of water splashing in a fountain. I doubt that either Petipa or Tchaikovsky had any idea the impact their ballet would have on the world over 200 years later! 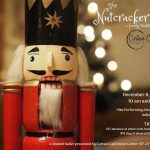 The Nutcracker has truly become a staple for professional companies and dance studios alike, as well as a huge holiday tradition for families everywhere. Favorite Nutcracker Roles and Experiences from the CC Staff! Miss Michelle had the great honor of performing with the Cincinnati Ballet’s professional version of the Nutcracker when she was young. Some of her most memorable roles were a soldier doll and an angel in Act 2. This role was particularly special because she got to sing with a live orchestra. 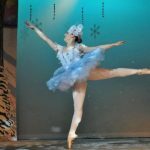 Miss Madison has danced many roles throughout her time as a student at Curtain Call Dance Center, However her favorites were her time as Snow Queen and Sugar Plum Fairy. On a personal note, I can say one of my favorite experiences choreographing for our version of the nutcracker was working with Madsion and a guest dancer in a Grand Pas de Deux. Please buy your tickets, supports these fabulous dancers and make new holiday memories! Tickets available at http://ccdc.booktix.com/ $15 online and $18 at the door. Parents, are you looking for an early Christmas experience for your young dancer or child? Do they have any family members or friends who would like the chance to meet real princesses? The Sugar Plum Fairy Pass is your chance to make real live Christmas memories! Your pass includes your only opportunity to meet Clara and Principle Dancers onstage. Your picture opportunity will be set behind the beautiful backdrops from the former Ballet Russe in Russia. Lastly you will be sent home with a swag bag filled with fun Nutcracker themed goodies. Tickets are 10$ and only available through the front desk. No online sales.